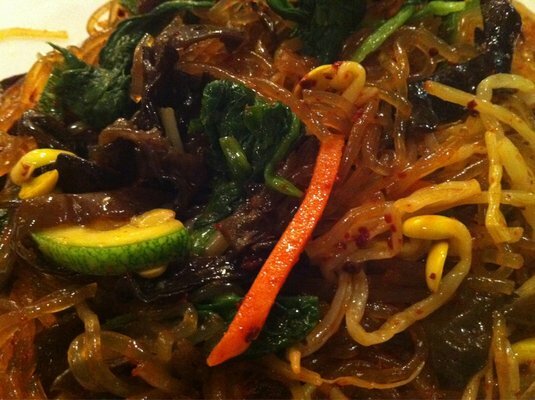 As much as I hate to admit it , I haven’t been that adventurous when it comes to Korean food. I found a few favorites and have been faithfully living off of those for the last few months. 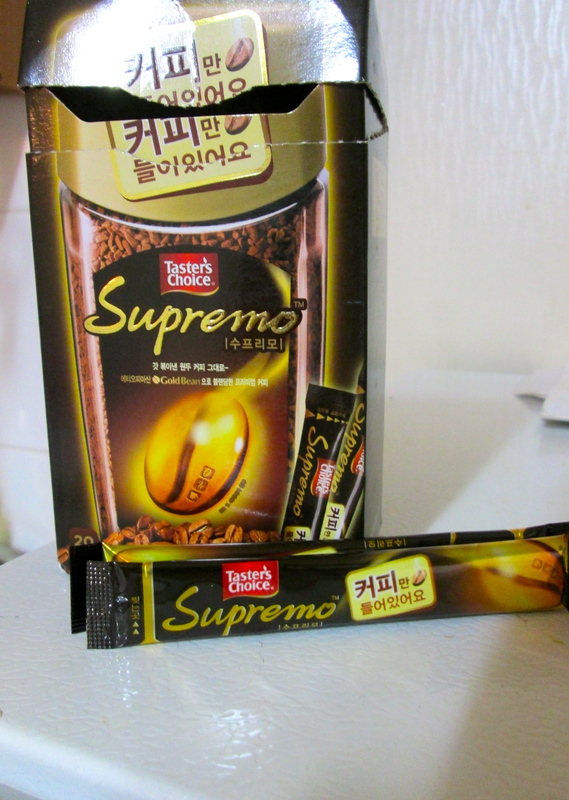 One of the goals I set for Seoul was to try any and everything that looked good. And I think I succeeded . 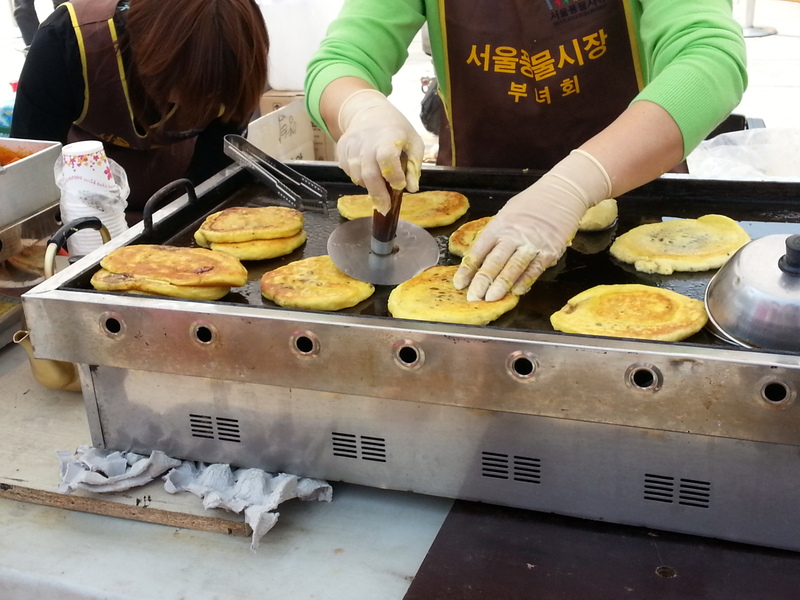 The best thing about Seoul was the street food. 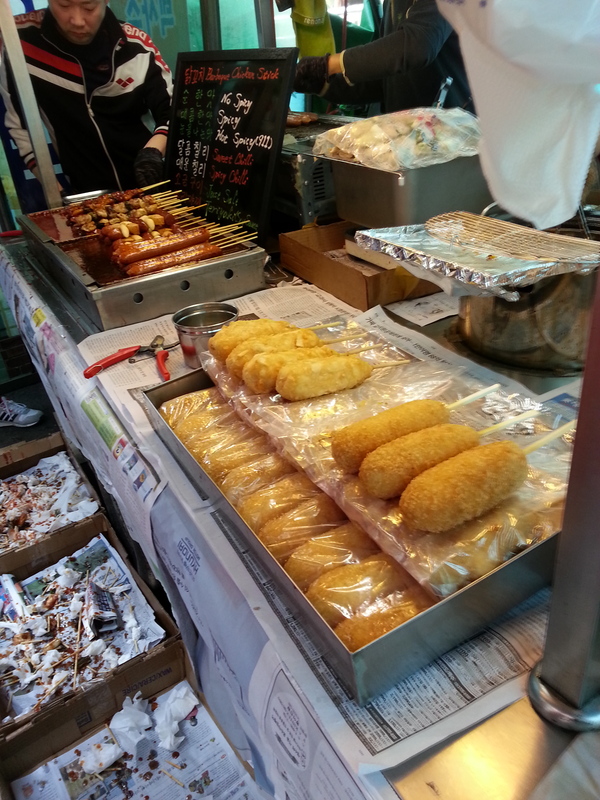 In every area of the city, you could walk down any street and instantly be surrounded by the scent of overflowing carts full of sticky desserts, steaming meats, and pots bubbling full of Korean national dishes. 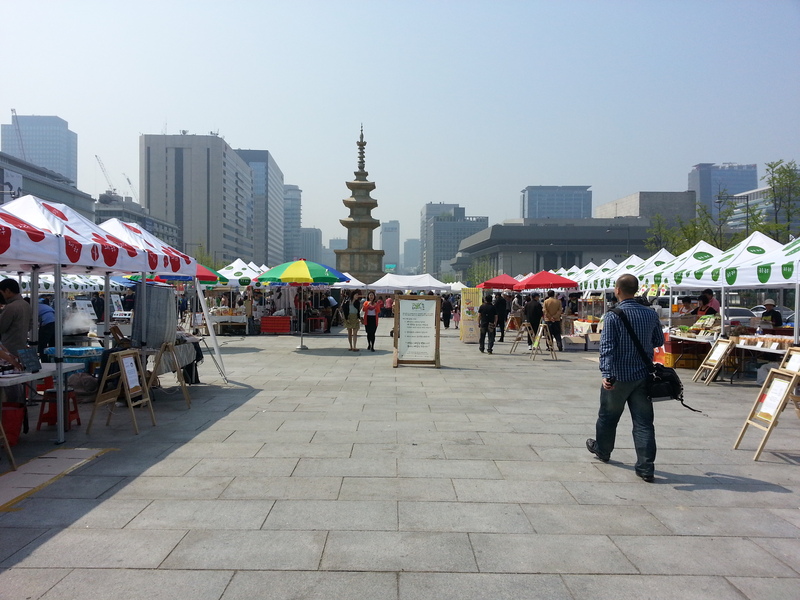 After an afternoon at Gyeongbokgung Palace, I ventured outside and discovered a flea market taking place in the neighboring plaza. Succumbing to curiosity , I walked over to discover that -instead of the antiques I anticipated – the many booths were full of food. 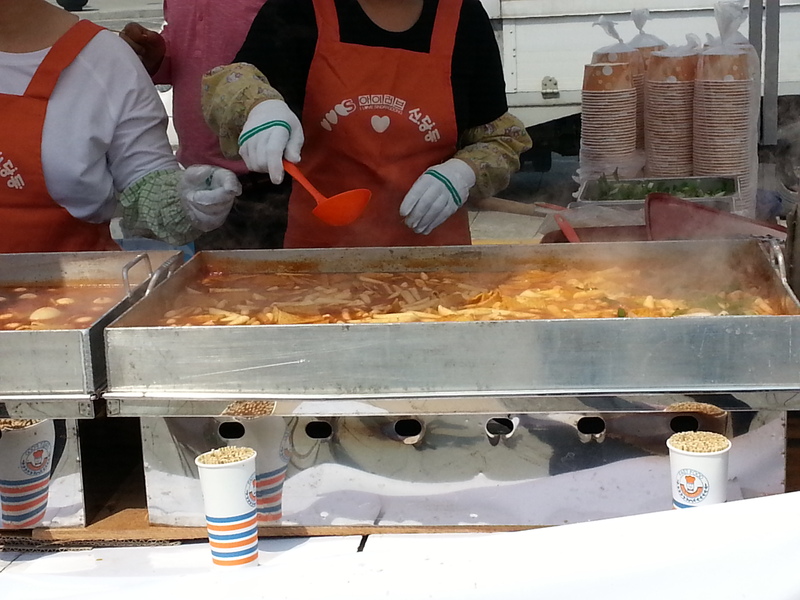 There were hot foods as well as bagged candies and delicacies. 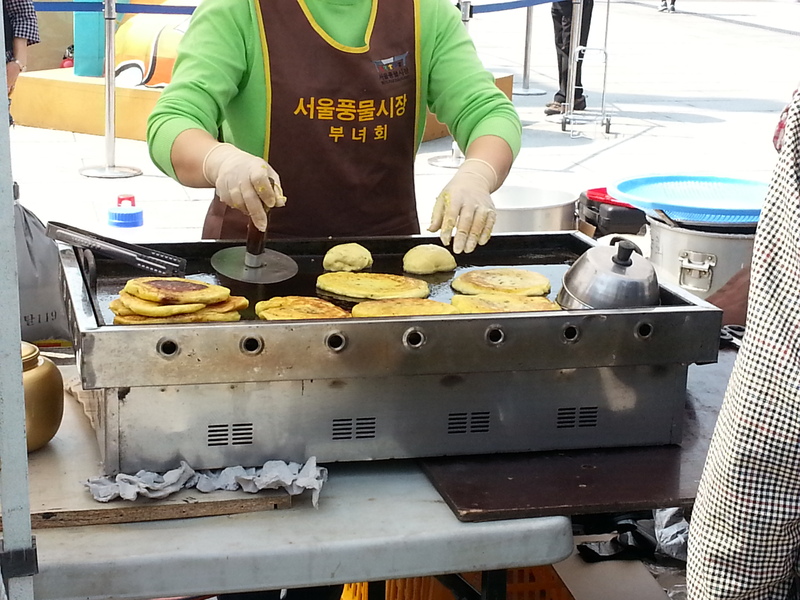 I ventured to one of the booths with a crowd and was greeted by a woman making one of Korea’s most popular foods-hoddeok. I watched the woman go on about her work; dipping a ladle into a container full of yellow dough with brown flakes. Once the dough started to sizzle on the hot plate and the smell filled the air, I realized it was cinnamon. The woman used a silver instrument to press on the dough until it was perfectly rounded and the cinnamon was gooey . Finally , she folded one into a dixie cup and handed it to me. 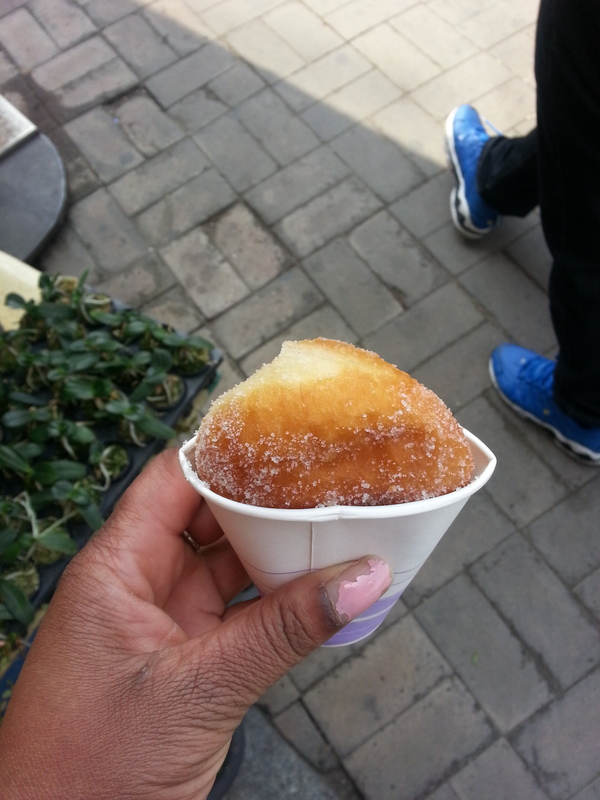 I got a bite of the runny cinnamon with the first bite and it paired perfectly with the crunchy outside. It was delicious – so delicious that I burned the roof of my mouth -several times- because I just couldn’t wait for it to cool. Even though the Hoddeok was beyond tasty , I needed actual food to power my exploring. 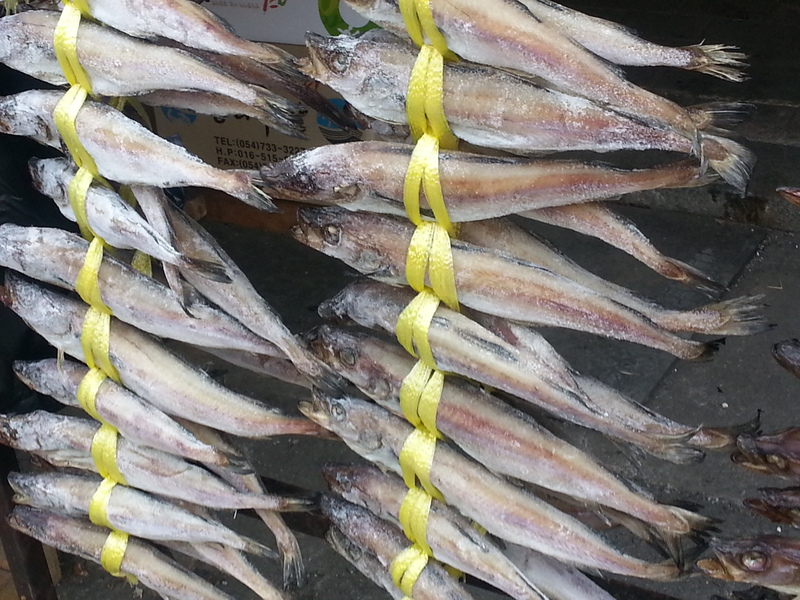 I found a larger meal outside of Seoul’s Dong Station. There are about a dozen tents lining one of the entrances and they were all converted into makeshift restaurants. The one I chose had a giant stove in the middle, metal tables surrounding it on three sides and little stools stationed around them. 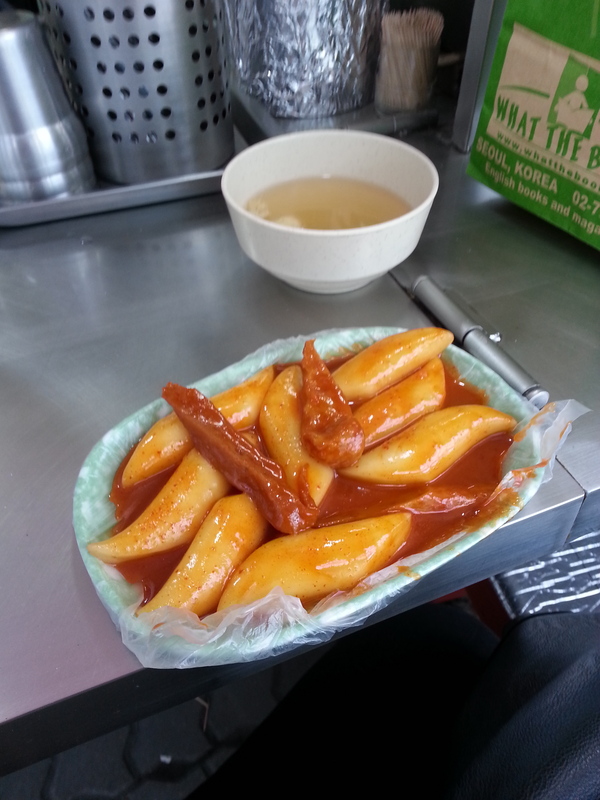 I got a plate of dukbokki (spicy rice cakes in a red pepper sauce) and a small bowl of minty soup for 3 US dollars. 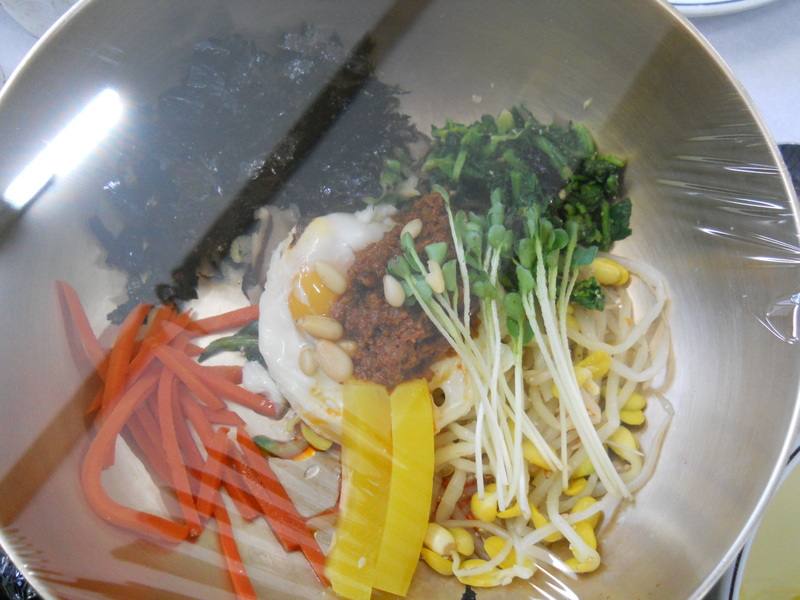 Thankfully, the dukbokki wasn’t as spicy as others I have tasted in the past. Even so , it was flavorful and filled me up . The next dinner was bit more conventional. 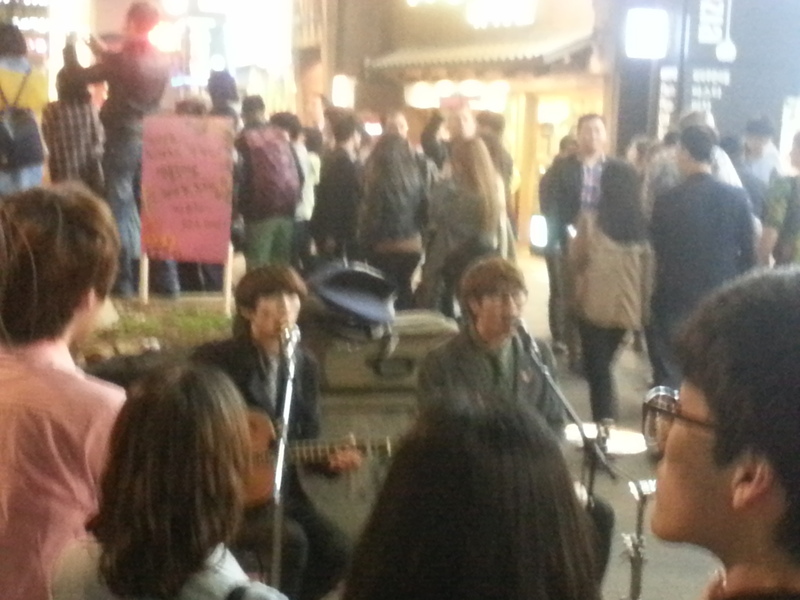 It was nearing midnight in Hongdae and store fronts were quickly going dark. I turned into the first restaurant I saw and found myself in tiny restaurant called Oodles of Noodles. 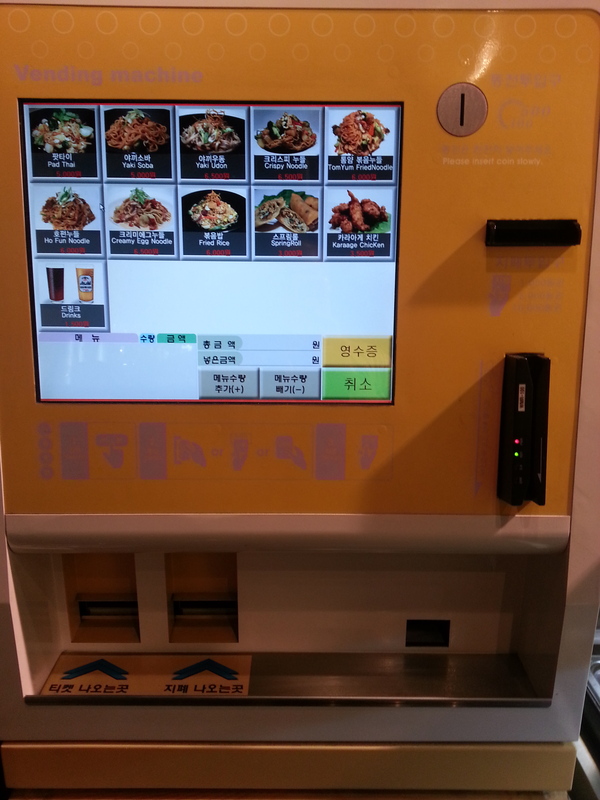 The smiling man behind the counter directed me towards a machine in the corner. I ordered and payed for my entire meal using the machine and soon after was served Pad Thai and a side of shrimp and cream egg rolls . 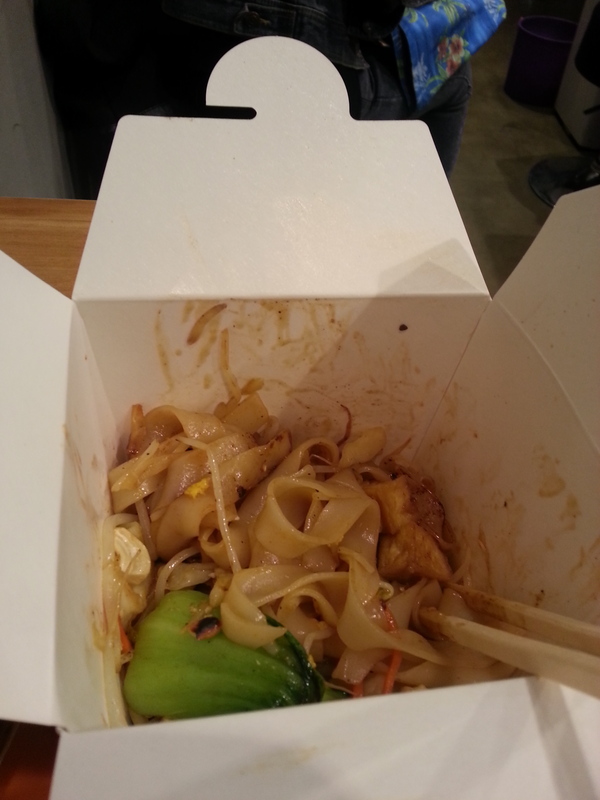 There was nothing special about the Pad Thai but it did taste great on an empty stomach. 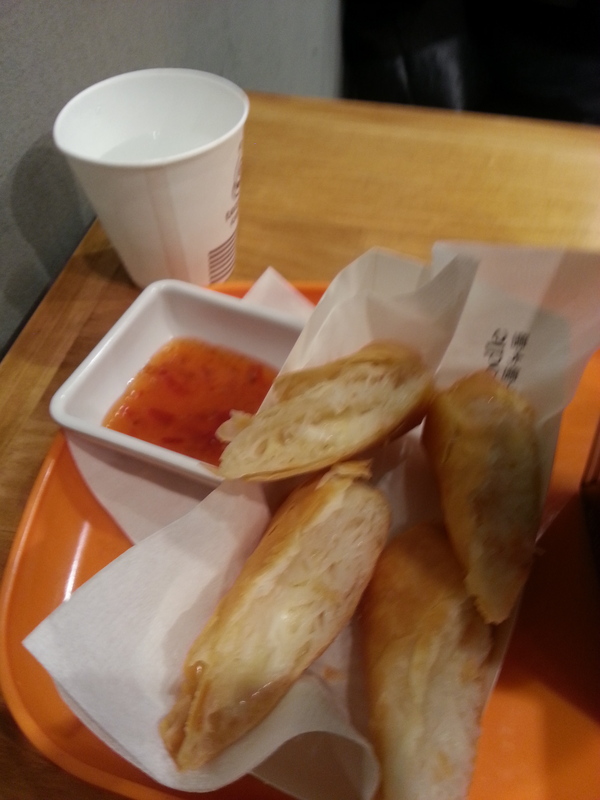 The eggs rolls, however, were amazing. Cream cheese and shrimp rolled into an egg roll doesn’t sound that appetizing but trust me -it is. 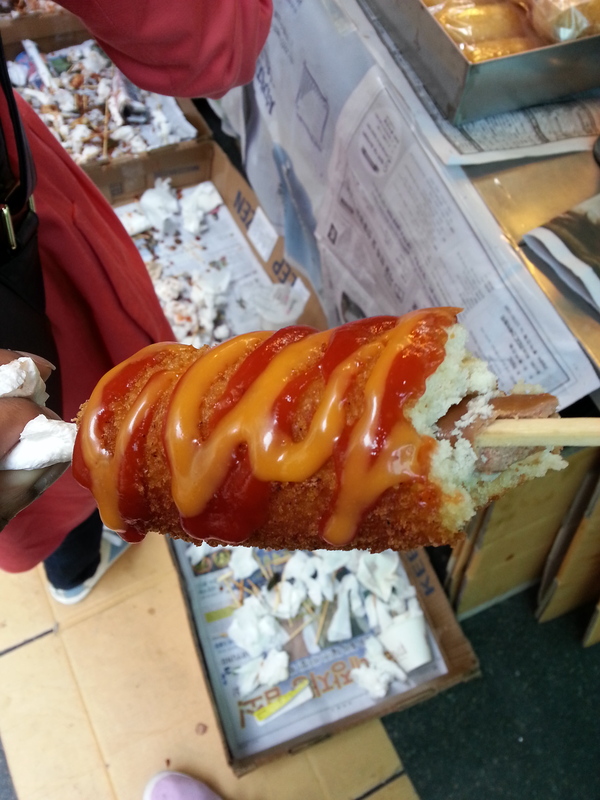 Last but not least- I finally had the courage to try the infamous Korean corn dog. I’m not big on hotdogs at home but luckily these were different- the breading is soft and flaky. Actually, it looks remarkably like Frosted Flakes. 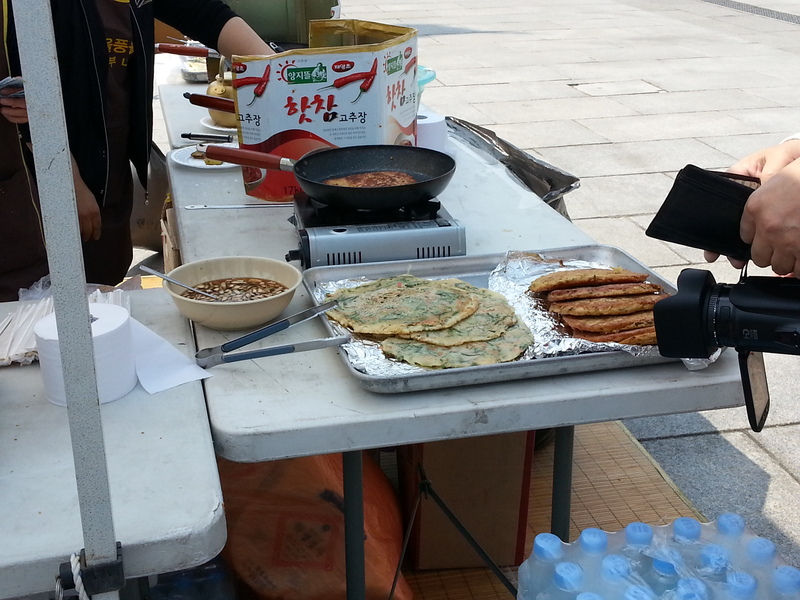 After handing over 1 won ( 1 USD ) the vender topped it with ketchup and some slightly spicy yellow sauce. It was so good I had to grab another for the bus ride home. 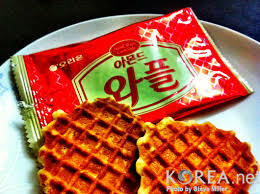 Any other Korean foods I should try ? 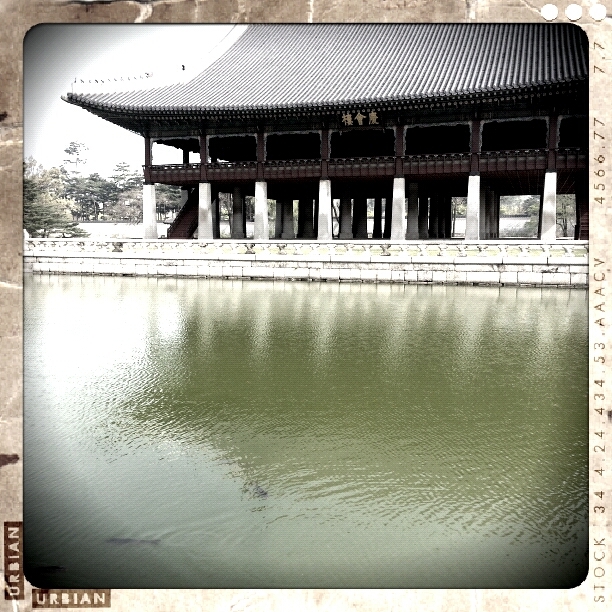 Over the weekend, I finally made the long trip to Seoul*. 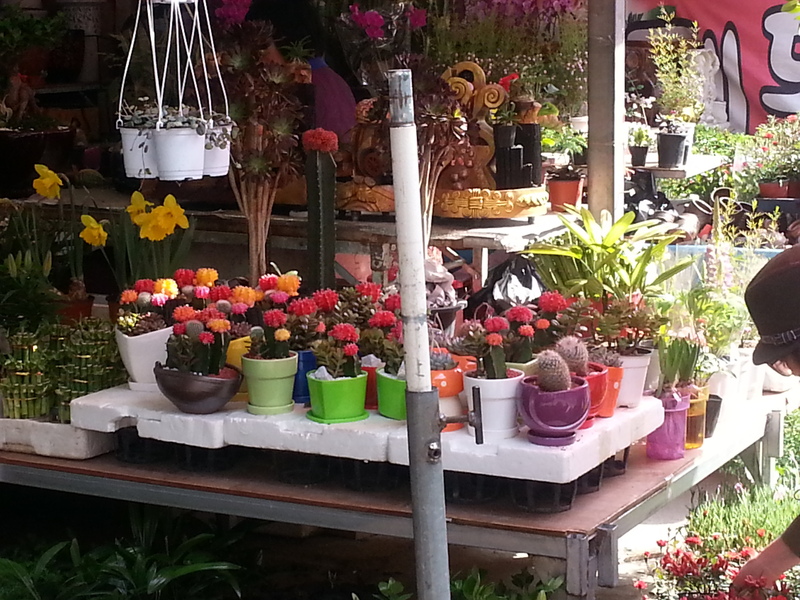 In between the crowded sidewalks and towering buildings, I felt totally at home. 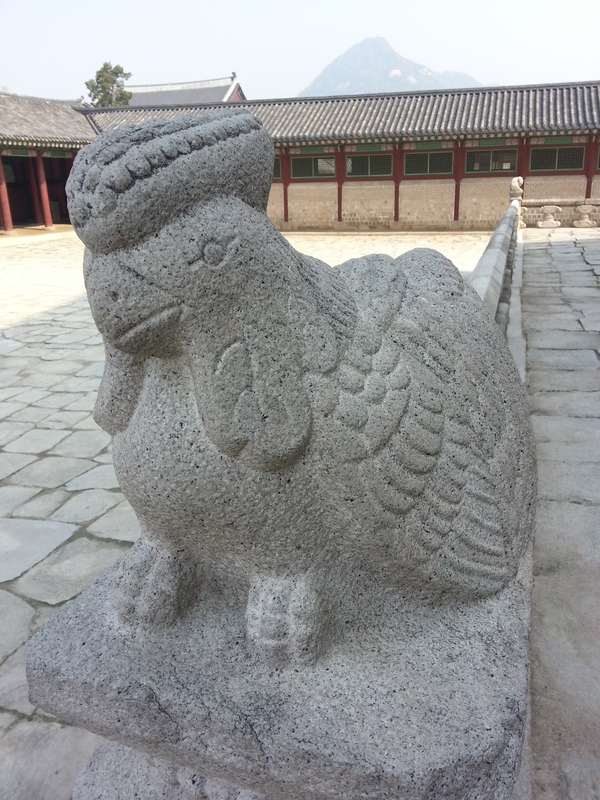 The most fulfilling part of the weekend was the fact that I did it all– from the five-hour bus ride from Pohang to finding my hostel and navigating the Seoul subway– solo. Maybe that solo backpacking trip is a possibility after all. 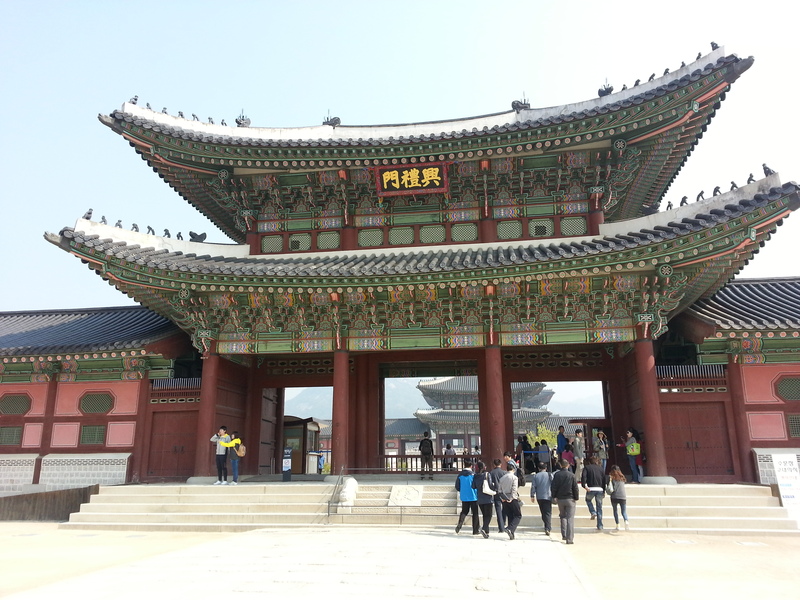 I couldn’t miss the opportunity to check out the legendary Gyeongbokgung Palace*. The Palace ( which translates to ‘Palace Greatly Blessed by Heaven’ ) was built in 1395 and was the center of the ancient city. 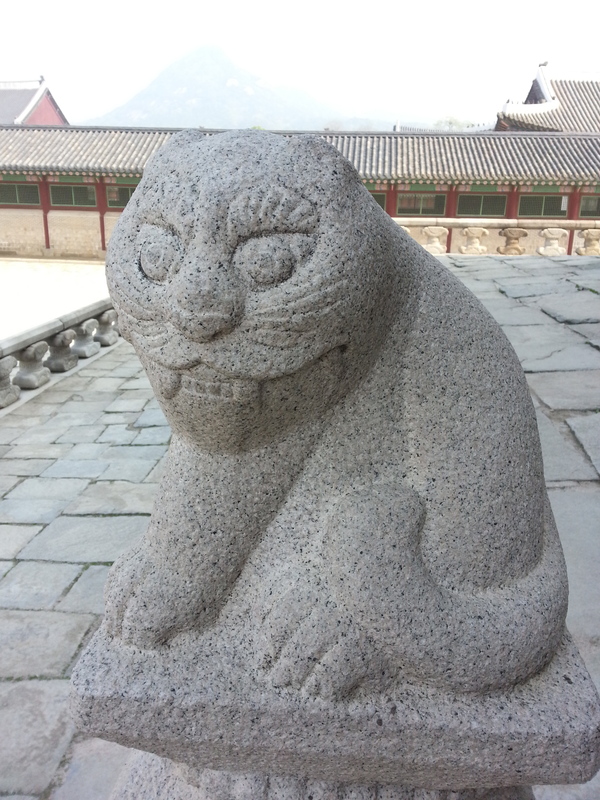 It was destroyed twice by the Japanese before complete restoration started in 1990. Even walking around the immense grounds in 2013 completely surrounded by smartphones and fancy professional cameras, the majesty of the Palace was still very much alive. 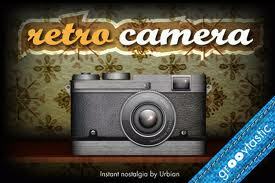 If you find the right secluded area to explore, it’s easy to pretend that you’ve stepped back in time. 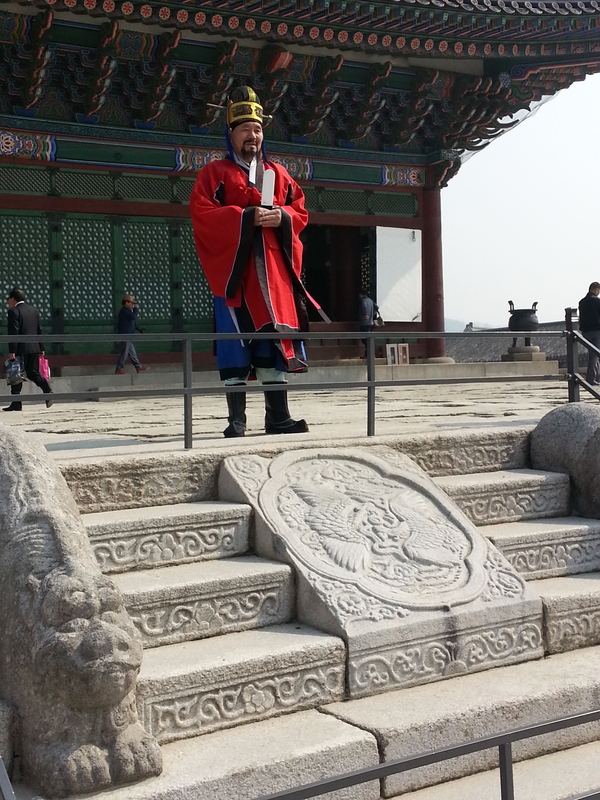 A guard dressed in traditional clothes waiting to greet the crowds. 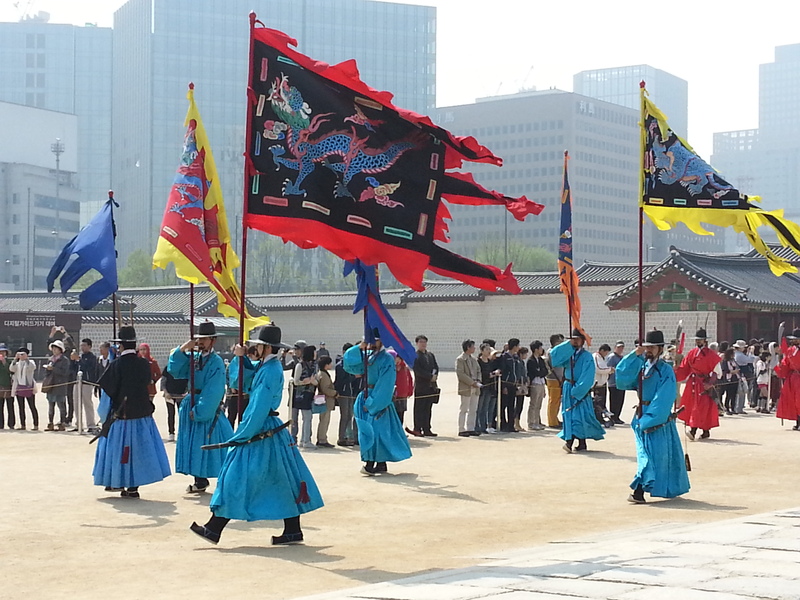 The highlight of my time at the Palace was seeing the traditional marching of the guards. 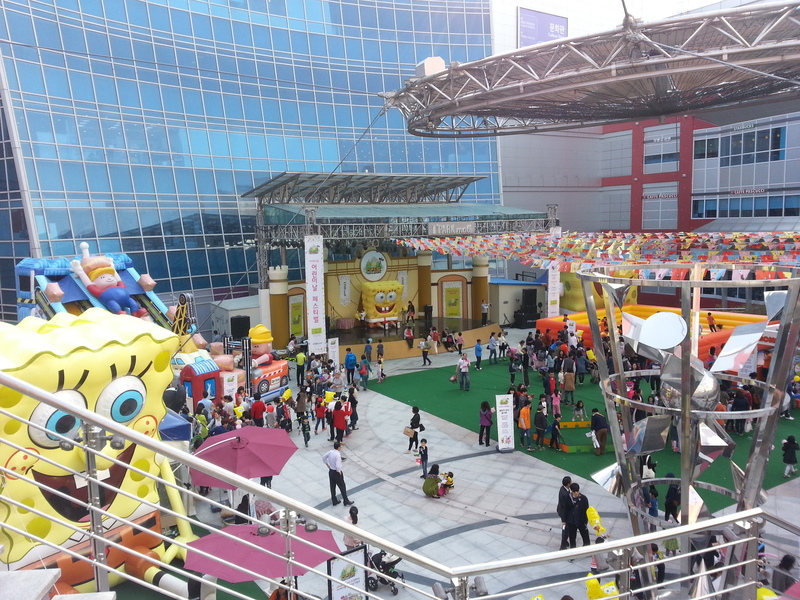 Another site I got to see was Ipark Mall*. It’s one of the premier shopping destinations in Seoul and has enormous wings dedicated to everything from home decor to clothing to electronics. One piece of advice: Be prepared to buy or walk quickly. A chorus of “May I help you?” will follow you through the aisles. Ipark is also home to a arcade, a plethora of restaurants, an outdoor theme park for the kiddies, and a CVG movie theater complete with 4D. 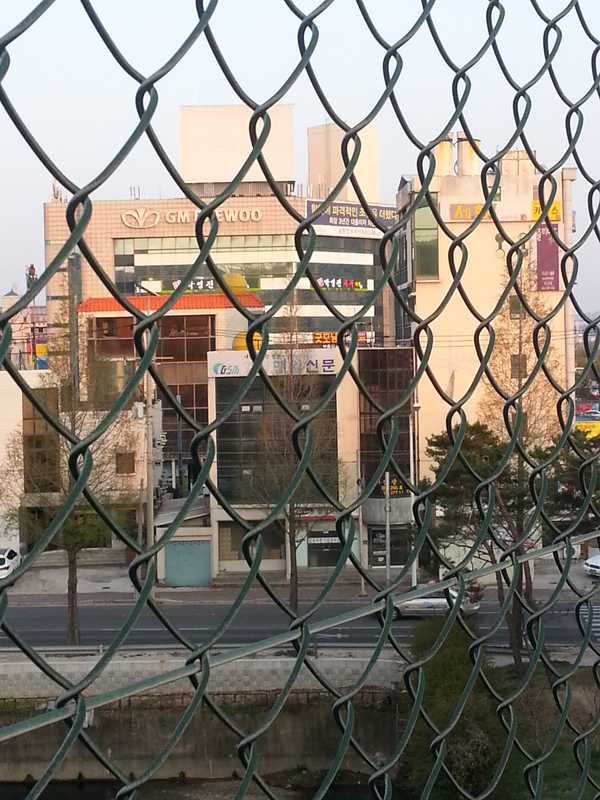 The hostel I stayed in was in the center of Seoul’s Hongdae* . 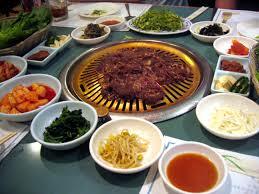 The area is packed with clubs, karaoke bars, and Western stores and thus, is one of the main hangouts for foreigners and young locals. I’m not much of a clubber but did wander the streets to get a feel of the place. 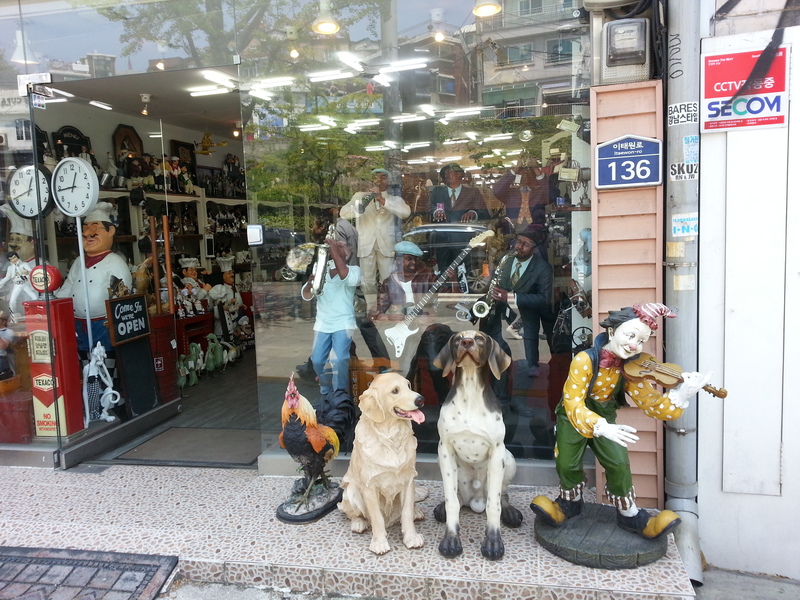 I could sum it up as such: Visit during the day to browse the kooky souvenirs and try out the cheap street food. Visit during the night to check out the many impromptu performances , observe the drunken crowds, or join the drunken crowds. 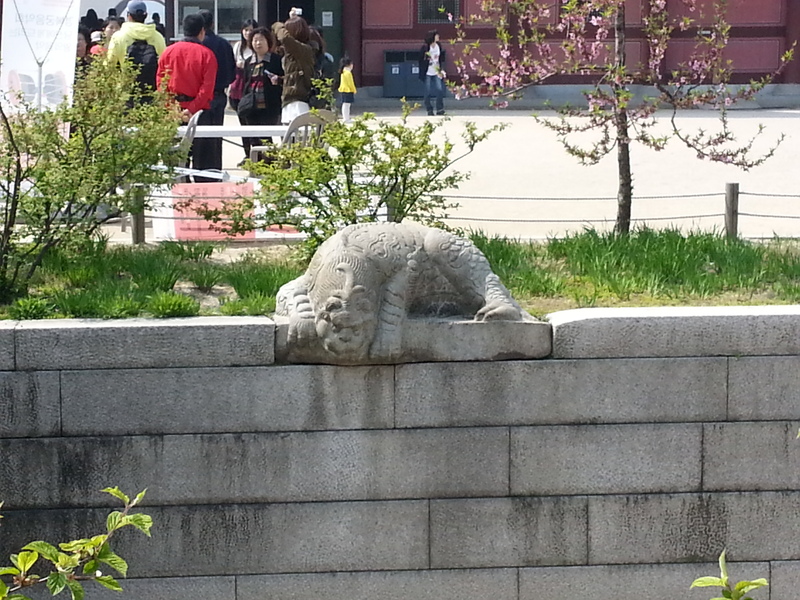 The last day in Seoul , I went to Itaewon*. I’ve heard it referred to as the foreigner’s paradise and it definitely deserves the title. There were almost as many foreigners as Koreans and I’ve haven’t heard that much English since leaving Philadelphia International. 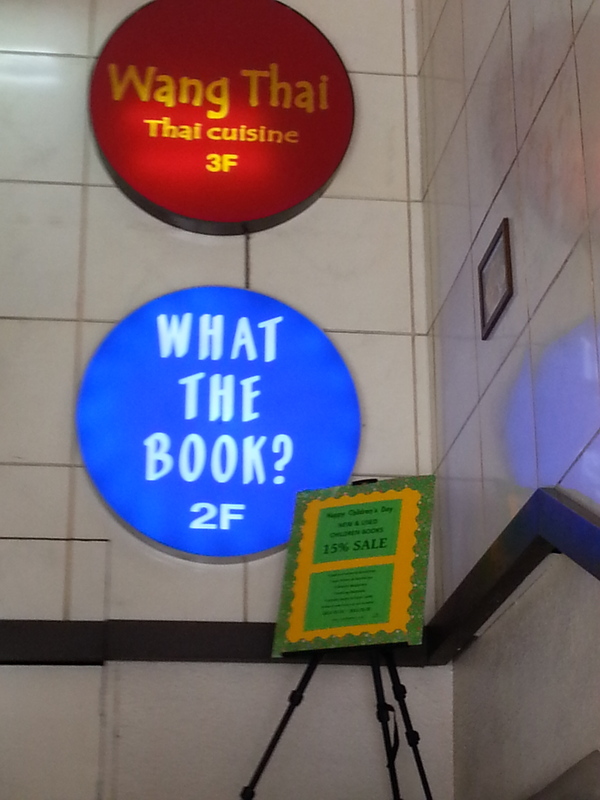 My main reason for visiting the area was to track down the famous What the Book store. It’s Korea’s largest English book store and carriers magazines as well as new and used bestsellers. I expected it to be more of a chill out spot – a la Barnes and Nobles- and was a bit disappointed to find no comfy arm chairs. 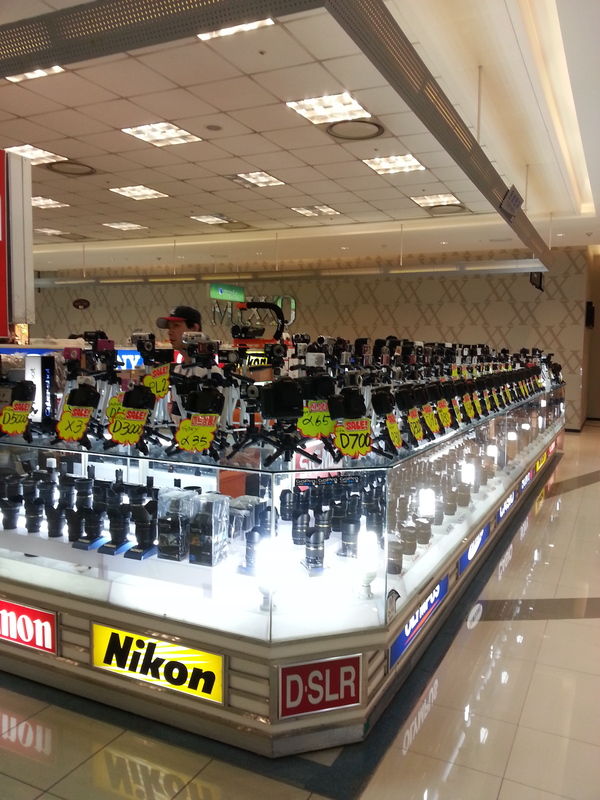 Even so , I was in heaven and had to force myself to leave before spending all of my money. 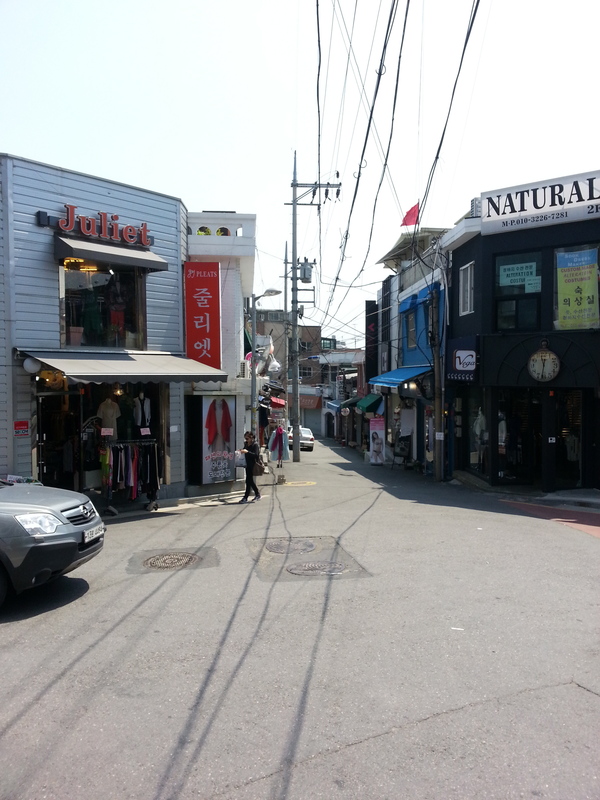 Itaewon is also a shopping destination. It’s narrow streets and twisting alleyways are full of shops and restaurants. 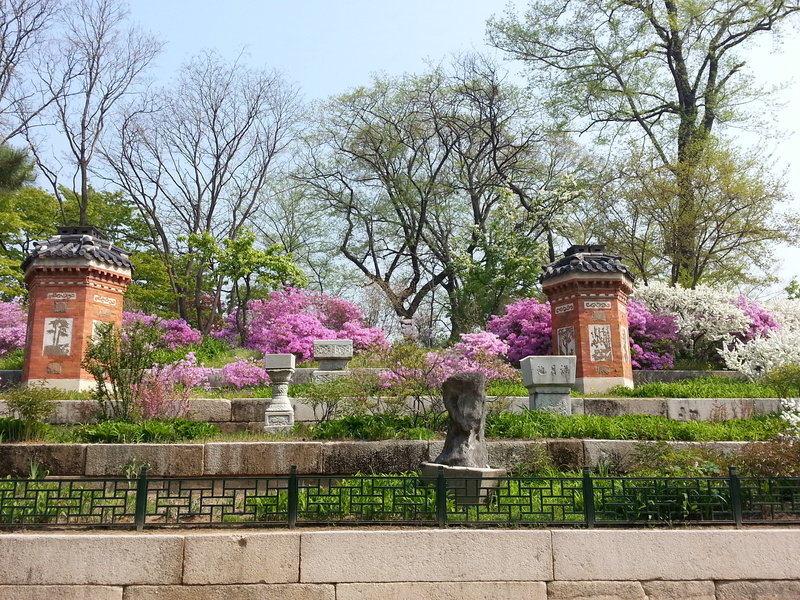 Whether you’re looking to experience Korean history, party the night away , or indulge in some Western comforts, you can find a way to do it in Seoul. 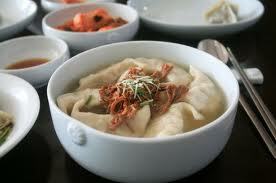 * To get from Pohang to Seoul by taking a bus from the Shiwae Bus Station next to the large HomePlus. 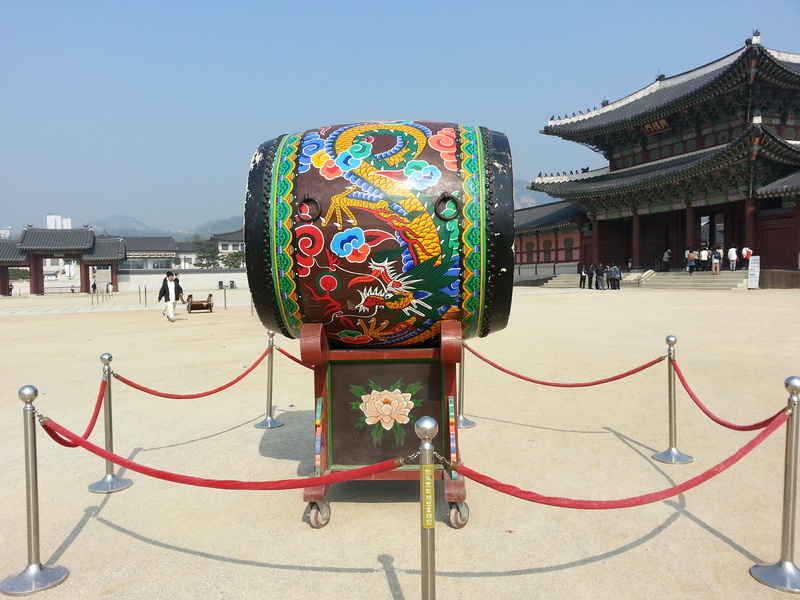 * To get to Gyeongbokgung Palace take the Seoul Subway line # 3 to Gyeongbokgung Station &exit at exit 5. Free tours in English depart at 11am, 1:30 pm, and 3: 30 pm. 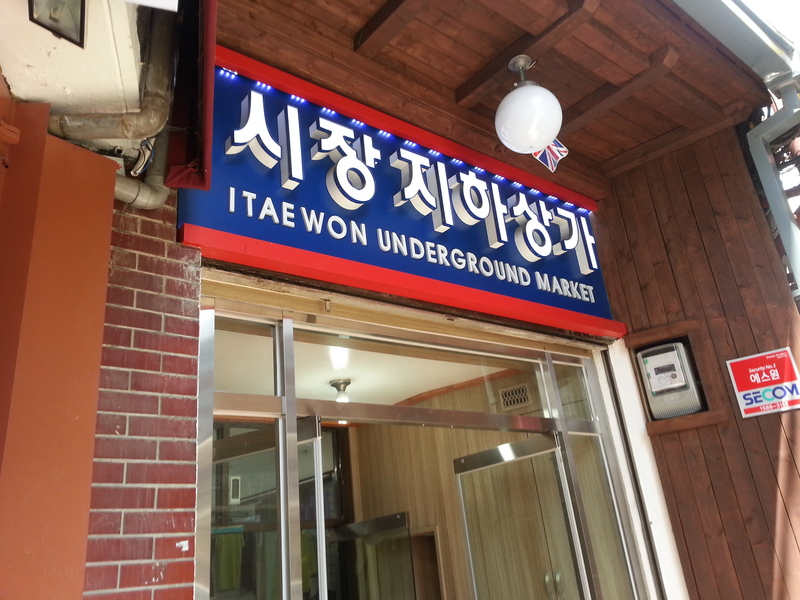 * To get to Itaewon take Seoul Subway line # 6 to Itaewon Station. 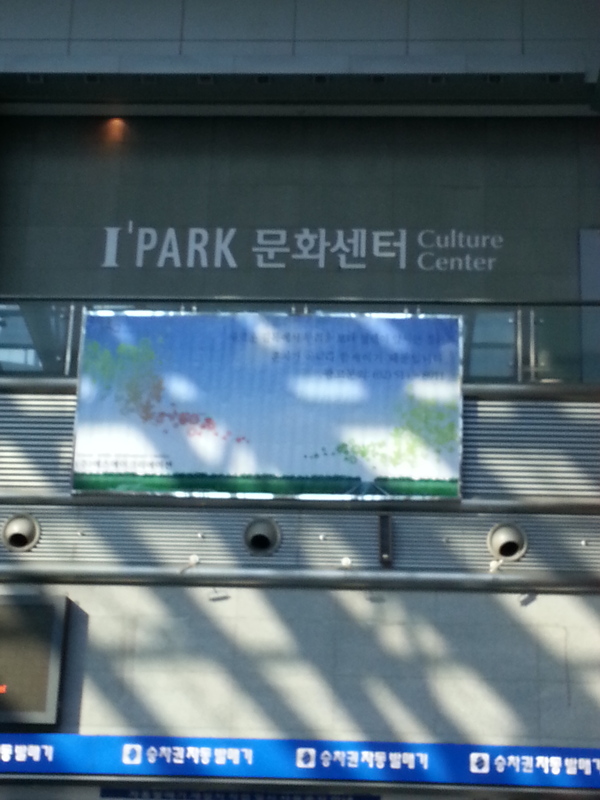 * To get to Ipark Mall take Seoul Subway line # 1 or #4 and exit at Yongsan Station. 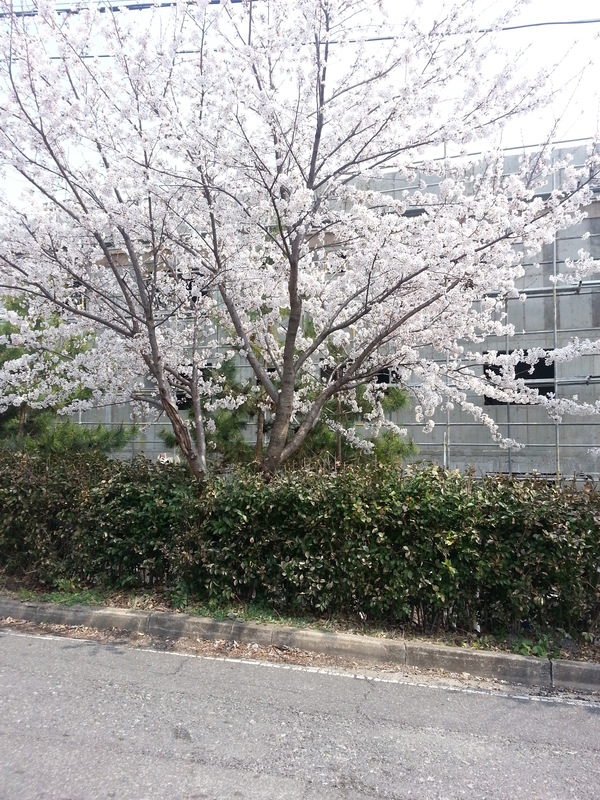 * To get to Hongdae take Seoul Subway line # 2 to Hongik University Station. 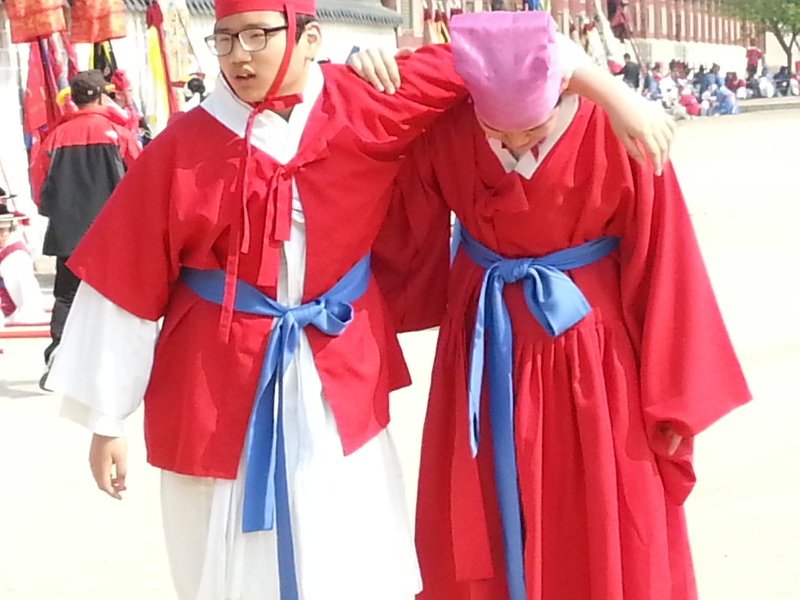 A quick and simple post sharing some photos of life in South Korea. 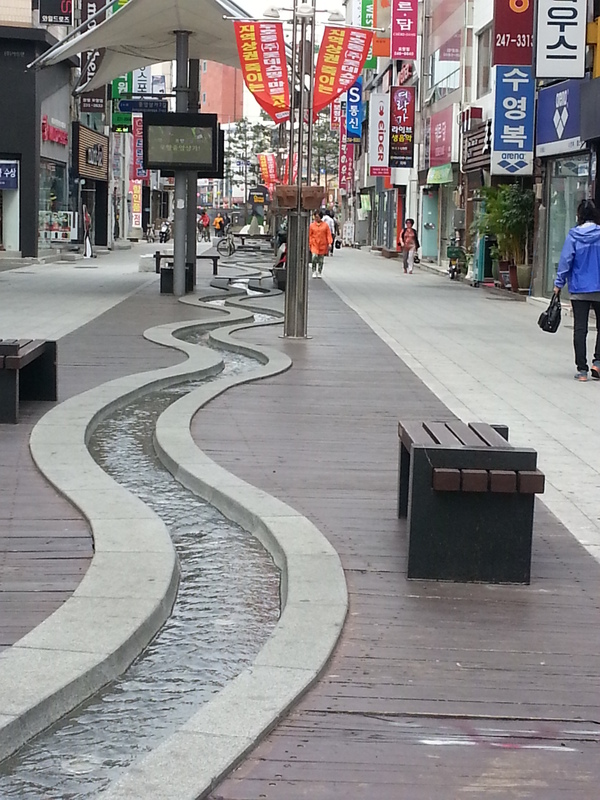 Stream Street: One of Pohang’s shopping destinations. Found this interesting fruit in the market. 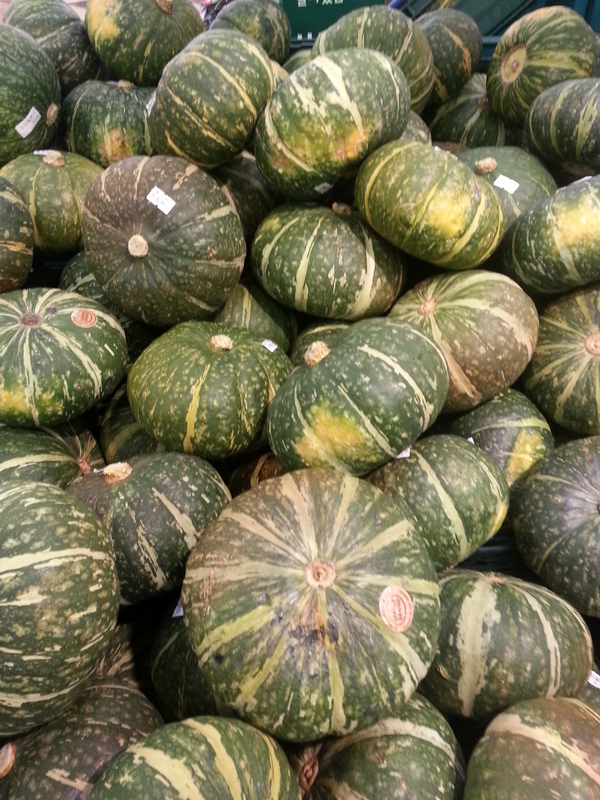 It looks like a green pumpkin but tastes like honeydew. 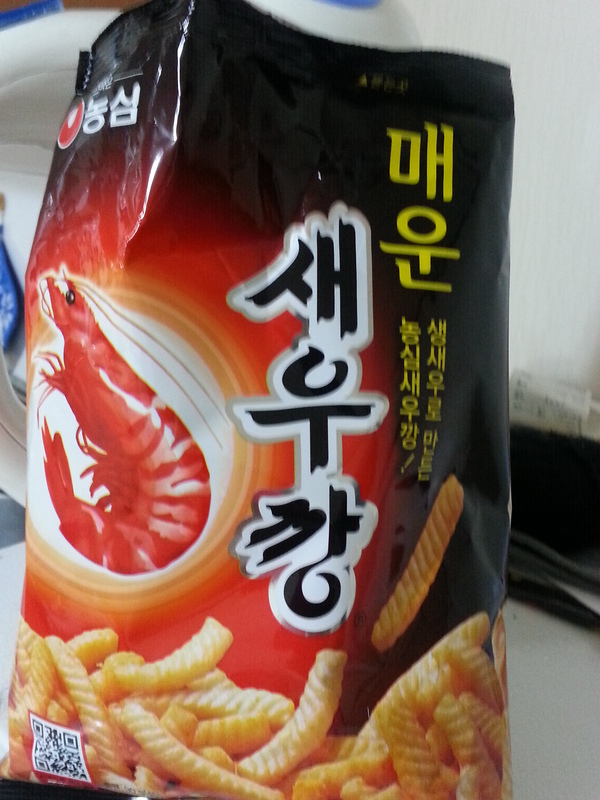 Shrimp Chips: Favorite Snack so far. 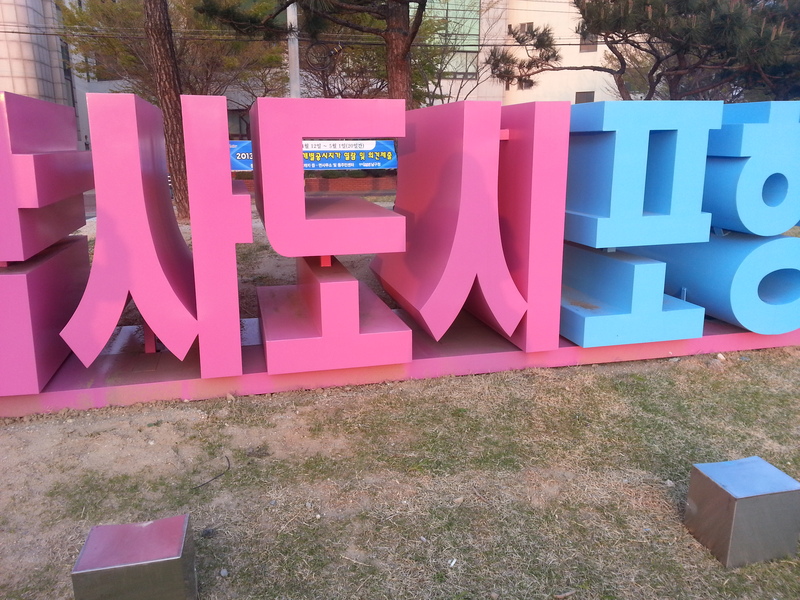 I’m guessing it says Pohang. 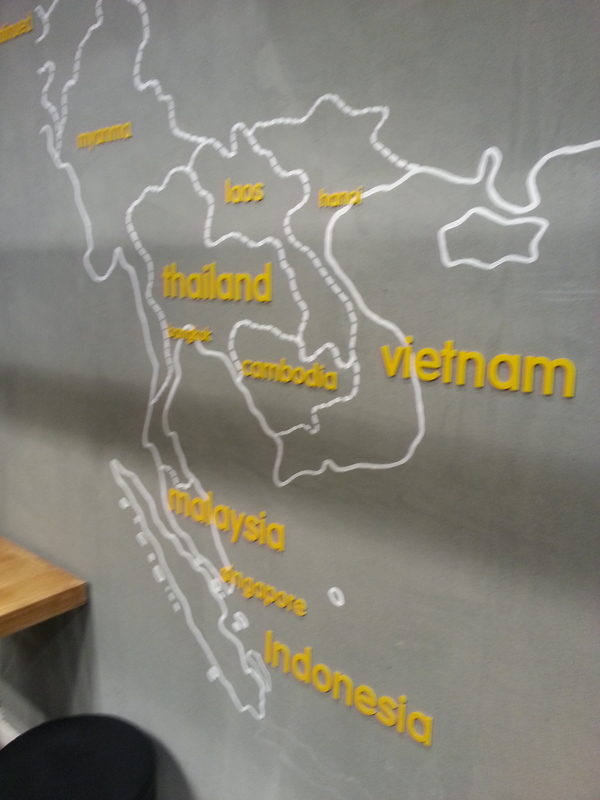 Both local and foreign foods abound here. 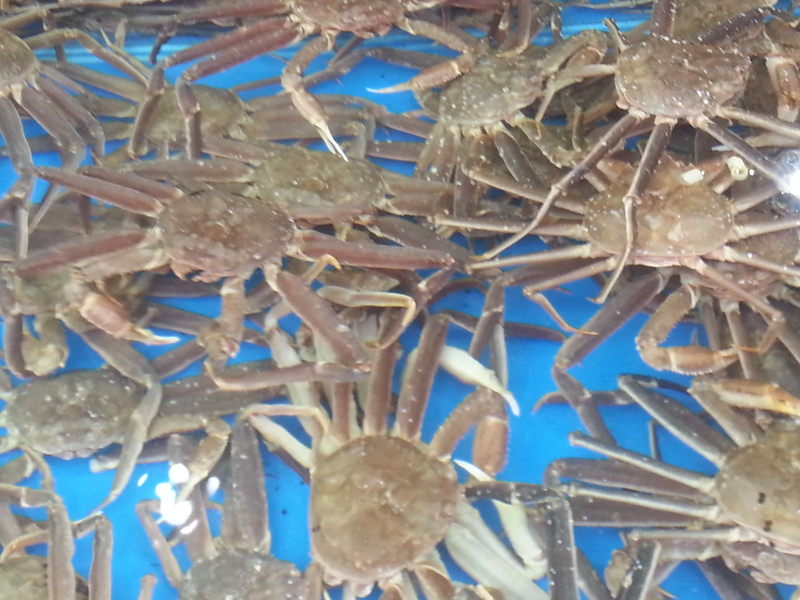 Dozens of streets are filled with fresh-water tanks and stands where seafood is sold and cooked right in front of you. Even if you’re not grocery shopping, it’s a place for sightseeing. I saw a live crab almost as big as my head! 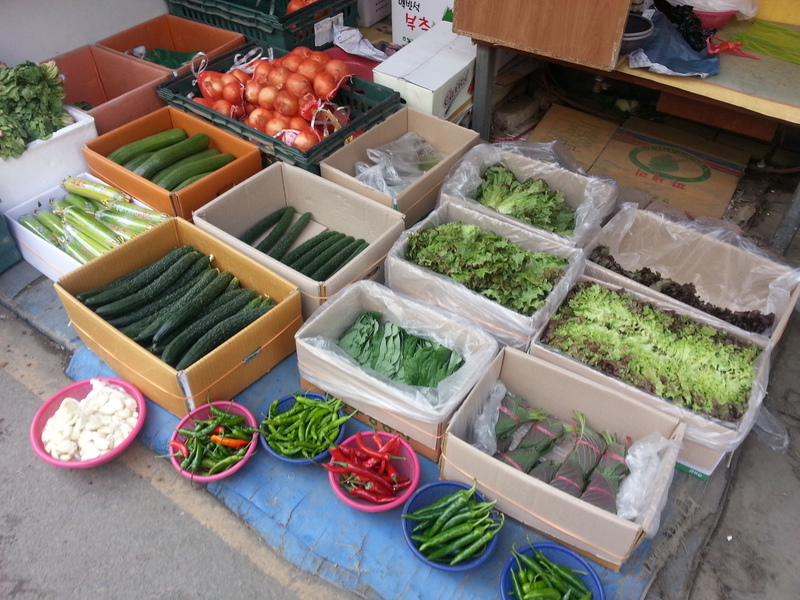 There’s also tons of cheap veggies and fruits as wells as some Korean specialties. 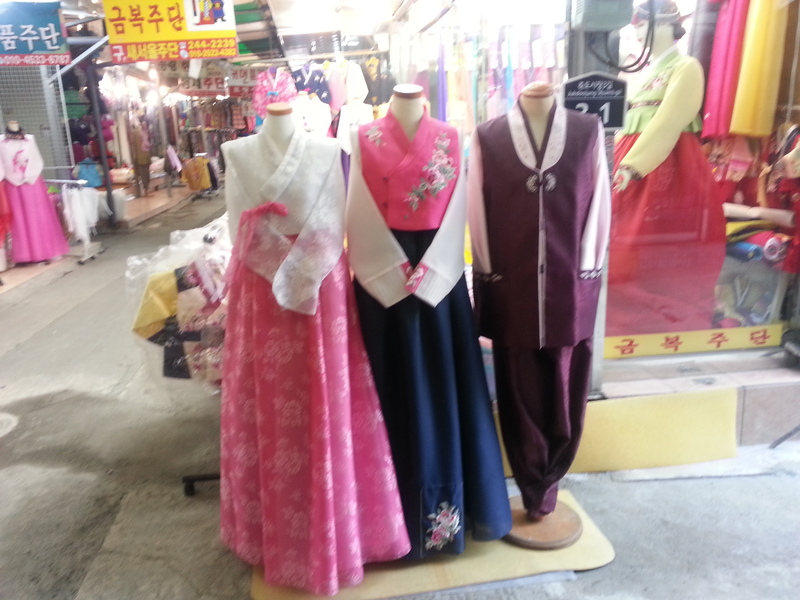 You can find traditional Korean clothes -like Hanboks- and Western style clothing also. 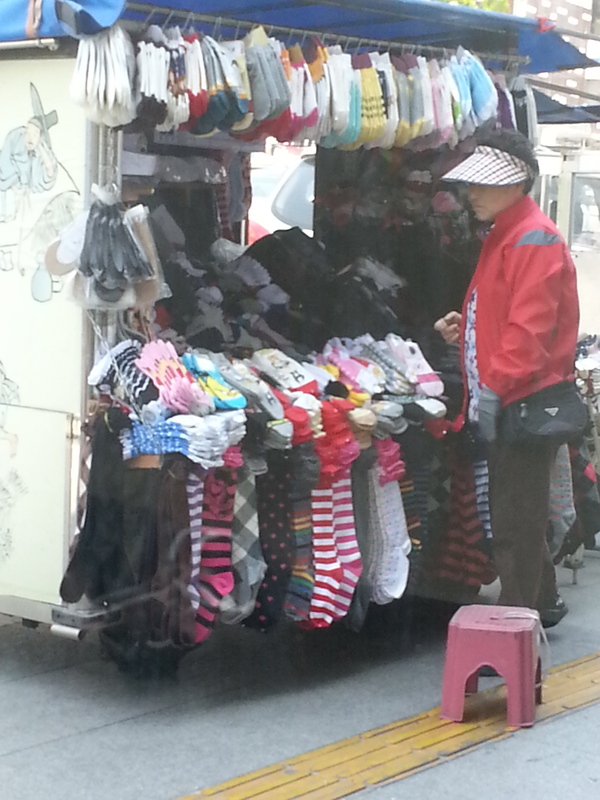 Beware-like most clothes in Korea-they run small. In need of some inexpensive decorations for your new apartment? 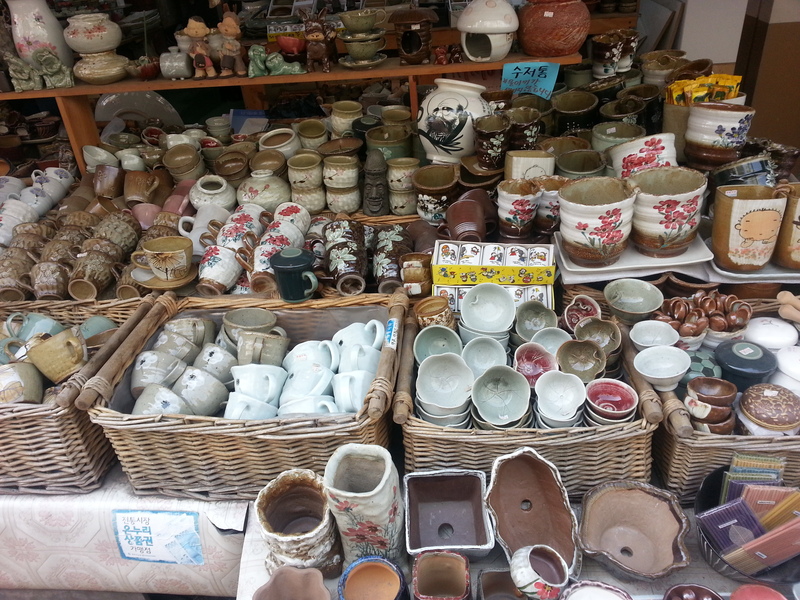 Browse through streets and streets of handmade pottery,furniture, and paintings. 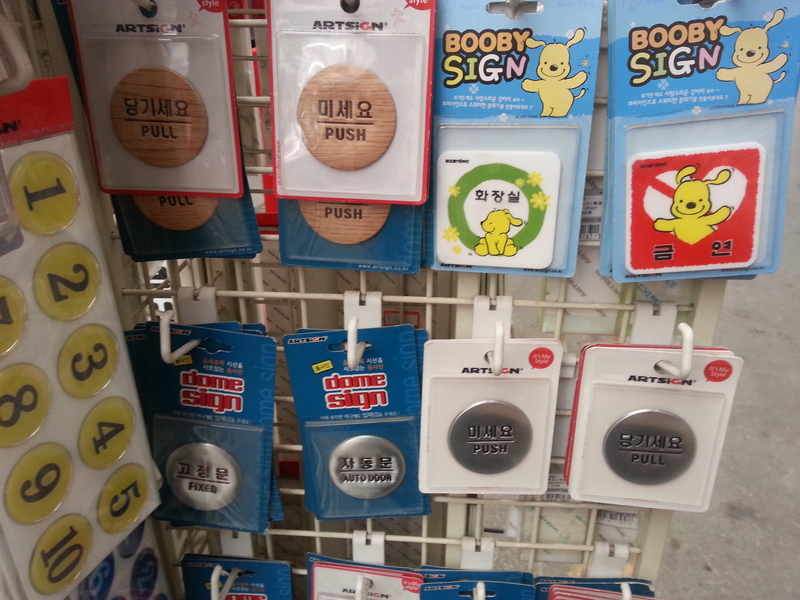 There are children’s toys, stationary,plants, and shirts with “Engrish” settings. 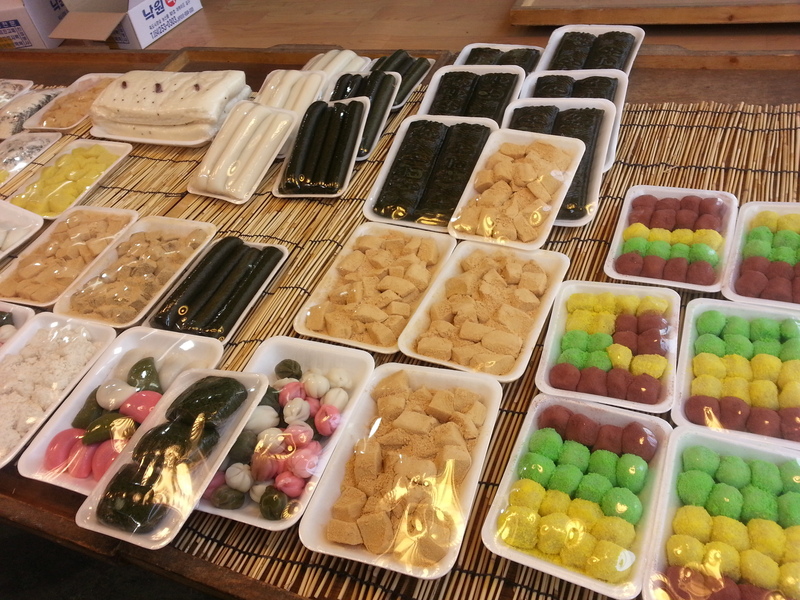 If you’re after a unique gift for someone back home, you won’t have to look too long to find one in Jukdo market. 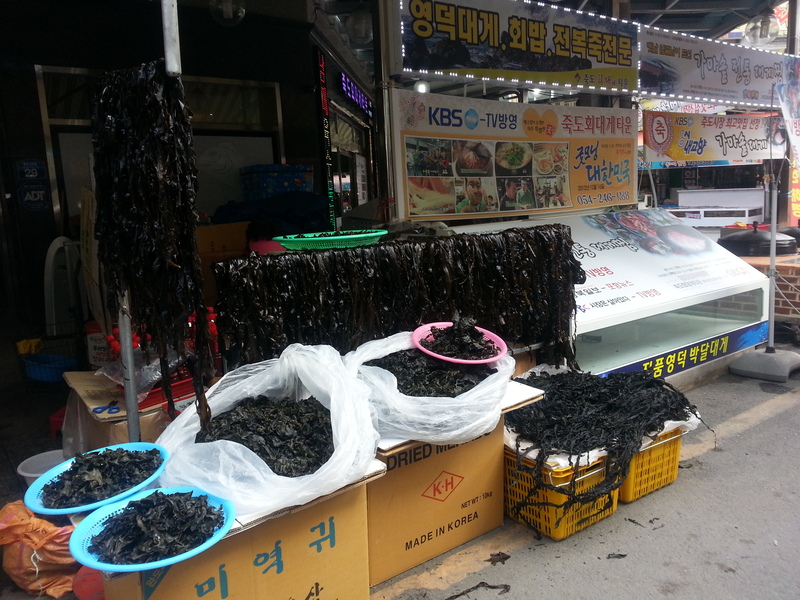 Nothing quite says “Welcome to Korea!”, than a morning here . Besides being surrounded by Korean language , cuisine, and culture on all sides, the many stares and people running up to greet you in English are sure to remind you how far away from home you are. It seemed like I was always the center of attention here, whether I was taking a picture, attempting to explain I didn’t speak Korean, or dodging out of the many motorcycles speeding by. Everyone was friendly, however, and seemed satisfied when I answered every question with “Miguk” (American). 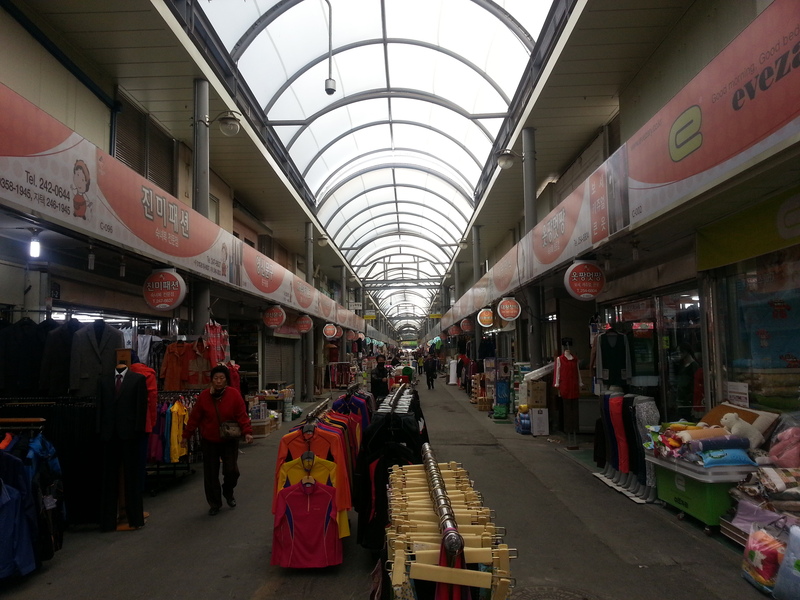 **Pohang’s Jukdo Market is opened from 8 am-10 pm and closed every 1st and 3rd Sunday of the month. 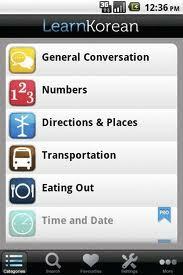 Buses 101, 103, 105,107, and 108 all make stops here. 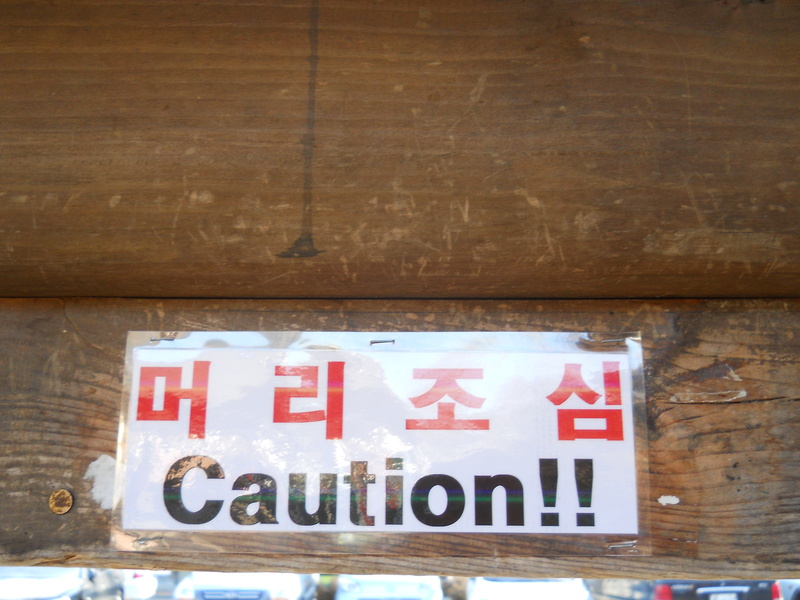 I could perfectly describe my Korean experiences so far in one word:overwhelming. That’s not to say it’s been bad at all-I’m learning and seeing new things every day and that is, after all, what I came here for. But sometimes when the things that were so simple and easy back home-like getting a cell phone,swiping a bus card, or even getting home- takes so much extra time and effort, it’s easy to be exhausted. I also think I’m realizing that I’m going to be here for at least a year, which means I don’t have to rush anything. When I was in Spain, I accepted every invitation and took every weekend trip I could because I knew I only had six short months-just a handful of school breaks- to see Europe. 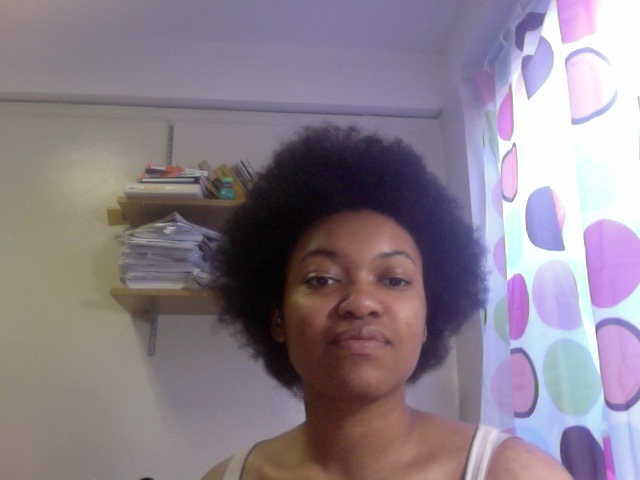 While a year can go by just as quickly, I’ve decided that I can ease into this transition. It’s okay that I didn’t KTX train to Seoul within the first month or that I couldn’t order a meal in Korean if I was starving. Being so new and having no idea what is going on or what I’m doing is an icky feeling, but it’s part of being a true expat. So, I embrace it. I’ve come up with some personal goals to help me ease into this new experience. Maybe they can help others in the same situation. I’m starting my second week of Hangul classes. 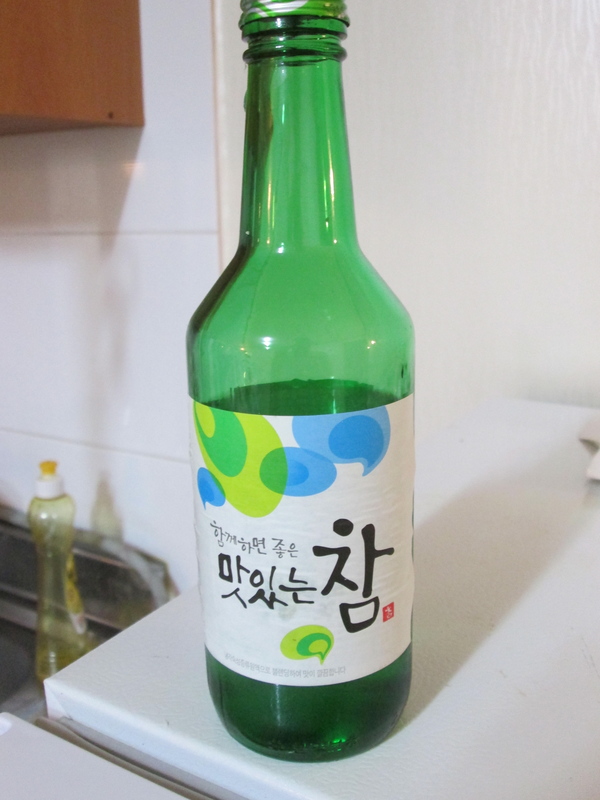 Fluency is too much to ask for; I’m just hoping to no longer be illiterate in Korean by the end of it. I feel like I have too much time to think ponder the meaning of life, how I should know it by now, and every embarrassing moment since 4th grade. 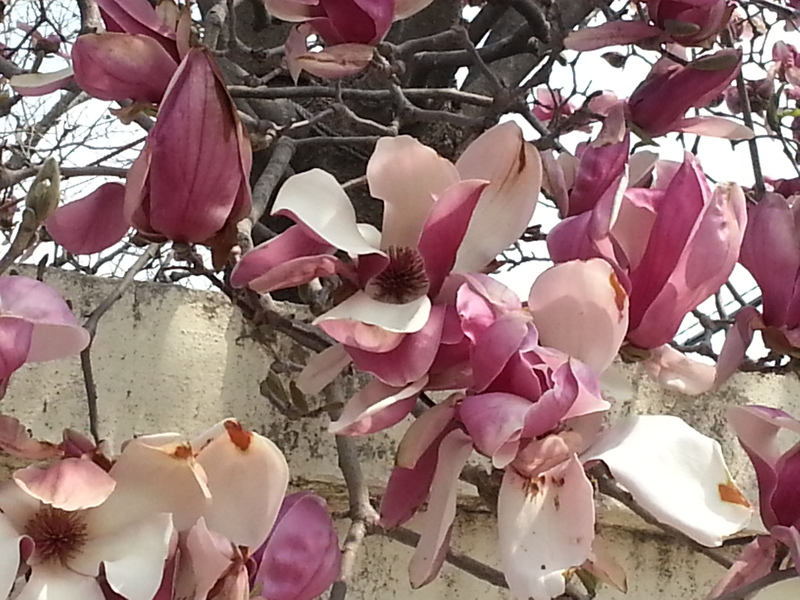 So, I want to find activities- like volunteering,yoga,freelance- to fill the void. 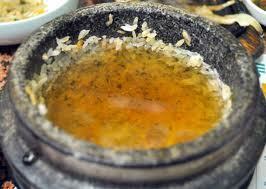 On the weekends and during vacations , I want to see Korea and Asia. I’m not going to learn the language overnight, be the perfect teacher by tomorrow night, or be up for every outing every time. That’s okay. I’m here-I’m going to take advantage of it. That’s all that matters in the end, right? 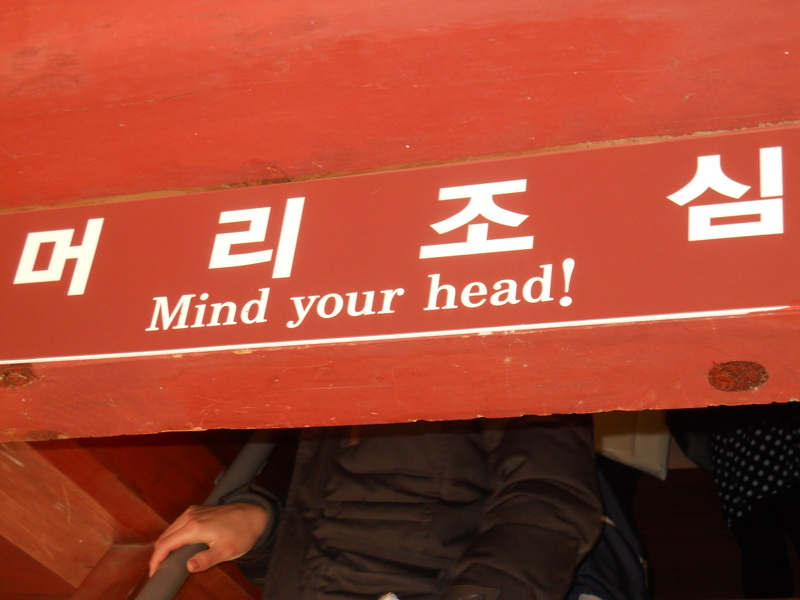 Oh, Korea. I will try! Do you have any tips for settling into a new place?